Here is my first card done with Gina K Designs newest images...they are set for release at the end of this week....now, being that I live near the coast...HOW COULD I NOT FALL HEAD OVER HEELS IN LOVE WITH THIS LITTLE GUY????? 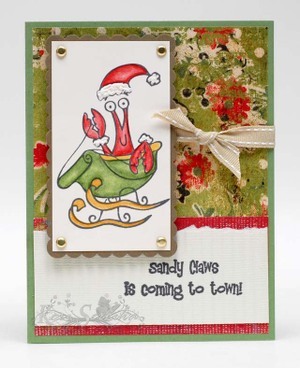 Ok so here is my first SANDY CLAWS card!!! Supplies: Patterned Paper: Daisy D's Cardstock: True Thyme, Wild Wasabi - SU!, Cream Cougar Opaque, Very Light Green Torn Strip: Bazzill Ink: Charcoal Fluid Chalk Ink - Clearsnap Brads and Ribbon: SU! Liquid Applique on cuffs and hat ball.